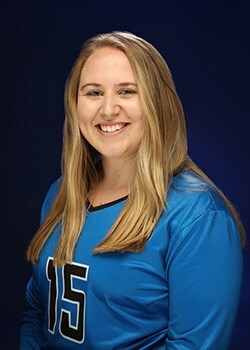 Sophomore setter Jayann DeHoog of Cal State San Bernardino has been named California Collegiate Athletic Association Women’s Volleyball Player of the Week. She averaged 10.81 assists/set (nearly a half assist above her season average) and tallied a career-high 22 digs in a win over Cal State Los Angeles with 53 assists (one shy of a season high). That was part of a 3-0 week for the Coyotes, who also chalked up wins over Cal State Dominguez Hills and Cal Poly Pomona. The Bakersfield native was the CCAA Freshman of the Year last season. The Coyotes (15-4, 9-2), ranked No. 18 nationally, are on the road this weekend with matches at Cal State San Marcos and UC San Diego. 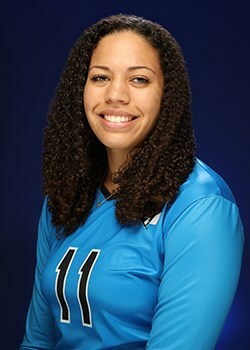 Cal State San Bernardino All-American senior middle blocker Malika O’Brien has been named California Collegiate Athletic Association Women’s Volleyball Player of the Week for Sept. 5-11. O’Brien, a graduate of Alta Loma High School, led the Coyotes to a 3-1 record in the top pod of the Division II West Region Volleyball Showcase at Sonoma State last weekend. The Rancho Cucamonga product helped CSUSB to 3-0 sweeps over two top-25 nationally-ranked teams, including No. 25 Cal Baptist and No. 14 and reigning NCAA West Region Champion Western Washington, as well as a narrow five-set loss to No. 12 Alaska Anchorage. O’Brien was the top hitter in the six-team tournament, hitting .462 (50-7-93), while also totaling 14 blocks and 12 digs. Her weekend was highlighted in the Coyotes three-set victory against the Lancers on Friday afternoon, as she smashed 10 kills on 13 swings without a single error for a .769 hitting percentage. On the weekend, O’Brien averaged 14.8 points, 12.5 kills, 3.5 blocks, and 3 digs per set. Cal State San Bernardino (26-5) volleyball program will make its 16th appearance in the NCAA Tournament but it will be the first time in their history that they will play in Alaska. The Coyotes received the No. 4 seed and will play No. 5 Central Washington on Dec. 3.